And the Poles waged a mortal battle against them. The Battle of Grunwald, also known as the First Battle of Tannenberg or Battle of Žalgiris, was fought on 15 July 1410, during the Polish–Lithuanian–Teutonic War. The alliance of the Kingdom of Poland and the Grand Duchy of Lithuania, led respectively by King Władysław Jagiełło (Jogaila) and Grand Duke Vytautas (Witold; Vitaŭt), decisively defeated the German–Prussian Teutonic Knights, led by Grand Master Ulrich von Jungingen. Most of the Teutonic Knights' leadership were killed or taken prisoner. 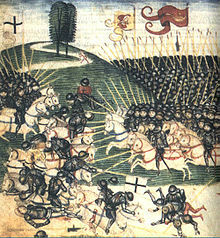 The battle was one of the largest battles in Medieval Europe and is regarded as the most important victory in the history of Poland, Belarus and Lithuania. When the emissary of Your Majesty, Oneš of Hurka, brought the definite news of victory and the praiseworthy armistice, it caused me great joy in my heart, which no pen can describe nor my voice express as is fitting. (...) Where, then, are the two swords of the enemies? They were indeed cut down with those swords with which they tried to terrify the humble! Behold, they sent you two swords, the swords of violence and of pride, and have lost many thousands of them, having been utterly defeated. Where are the swords, where the caparisoned horses, where the mail-clad warriors in whom they trusted? Where are the innumerable ducats or treasures? The battle turned into carnage and pursuit. Those who refused to surrender, died. And the Polish units, abandoning a hesitation which delayed them, threw themselves with many regiments at the enemy, who were positioned in sixteen regiments, in which found refuge also those who had suffered defeat under other banners, and the Poles waged a mortal battle against them. And although the enemies put up a resistance for some time, ultimately, surrounded by great numbers of the king's army, they were put to the sword and virtually all units fighting in the sixteen regiments either perished or were taken prisoner. After defeating and crushing the enemy's army, during which – as it is known – Grand Master Ulryk, marechals, commanders and all the more prominent knights and lords of the Prussian army perished, the remaining crowd of enemies beat a retreat and once they turned tail they began to run away with determination. The battle turned into carnage and pursuit. Those who refused to surrender, died. There had been many battles and engagements in those times across the world, but none of those alive remembered a devastation so terrible. At the great king's feet fell not only the Teutonic Order, but all of Germany, whose foremost knights supported the Teutonic avant-garde that was biting deeper and deeper into the Slavic flesh. Out of seven hundred "white cloaks" leading this Germanic deluge, only fifteen survived. More than forty thousand bodies lay in eternal sleep in this blood-soaked field. Polish: Bitwa zmieniła się w rzeź i pościg. Kto nie chciał się poddać, zginął. Wiele bywało w owych czasach na świecie bitew i spotkań, ale nikt z żywych ludzi nie pamiętał tak straszliwego pogromu. Padł pod stopami wielkiego króla nie tylko Zakon krzyżacki, ale i całe Niemcy, które najświetniejszym rycerstwem wspomagały oną "przednią straż" teutońską, wżerającą się coraz głębiej w ciało słowiańskie. Z siedmiuset "białych płaszczów" przodujących, jako wodzowie tej germańskiej powodzi, zostało ledwie piętnastu. Czterdzieści przeszło tysięcy ciał leżało w wiekuistym śnie na onym krwawym boisku. Piles of corpses, piles of bodies, and a river of blood flowed! a krew rzeką płynie, rzeką! The most portentous national disaster was not the sad downfall of the Hohenstauffens owing to the intrigues of Papal and French policy, but the defeat of Tannenberg, which resulted in the loss of a large portion of the colonisation work of centuries, and the cession to the Poles of West Prussia and Danzig, and which put an end to the proud independence of the State of the German Order of Knighthood. (...) It may be questioned whether, had it not been for the black day of Tannenberg, the State of the Order of Knighthood would have been able to keep the East permanently German, in defiance of the superior power of Poland. Source: Bülow, Bernhard von (1914), Imperial Germany, New York: Dodd, Mead and Co.
To arms! Fight the Germans wherever you encounter them! Assault their transports, provide information, aid Polish and Soviet soldiers! On liberated territories, fulfill mobilization orders and enlist for the Polish Armed Forces, which will avenge the September defeat and, together with the armies of Allied Nations, will deal the Germans another Grunwald! Polish: Chwytajcie za broń! Bijcie Niemców wszędzie, gdzie ich napotkacie! Atakujcie ich transporty, udzielajcie informacji, pomagajcie żołnierzom polskim i sowieckim! Na terenach wyzwolonych wypełniajcie karnie nakazy mobilizacyjne i śpieszcie do szeregów Wojska Polskiego, które pomści klęskę wrześniową i wraz z armiami Narodów Sprzymierzonych zgotuje Niemcom nowy Grunwald! This page was last edited on 25 May 2016, at 13:32.